We LOVE weddings at Keythorpe Manor in Leicestershire! On Saturday 7th July 2018 we had the pleasure of once again working with the Keythorpe Manor weddings team for Dipti and Michal’s magical day. Dipti booked our photo booth services back in March after finding us online. 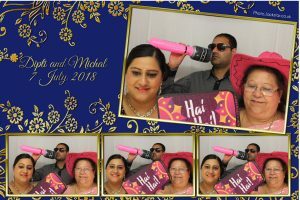 The couple opted for our plain white photo booth, along with 3 hours of unlimited double prints, postcard sized prints, guest book and props box. Dipti also asked if we had had Bollywood props to go with her theme. After finding something online that she liked, we were only too happy to help Dipti with this and added in some extra props for the occasion! Our props boxes are always changing, so we are happy to add in additional items where we can. 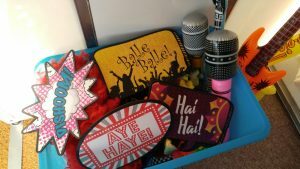 Along with getting in some new Bollywood themed props for our photo booth props box, we also worked with Dipti on her print design. After upgrading to our postcard sized prints our design team worked with Dipti to put together a print design which incorporated her blue and gold colour scheme. Finally all of the timings were confirmed, position of the photo booth etc with both the couple and Keythorpe Manor. On the day Jack arrived at Keythorpe Manor slightly ahead of time. He waited until the couple themselves arrived before setting up the photo booth in the entrance area whilst everyone was busy inside the main marquee. The photo booth was then ready and open for 7.45pm as requested by the bride and groom. The bride provided her own personalised guest book for the big day, which Jack used to stick in the extra copy of the prints and encouraged the couples guests to leave them a message. Along with printing photos on the day our photo booth was also doing video messages. After guests had taken a photo Jack encouraged people to also leave the newly married couple a video message to wish them well as they begin their next chapter as husband and wife. Following Dipti and Michal’s wedding at Keythorpe Manor we sent over a link and password to the couple where they are able to download and share the photo’s if they wish. We also sent over the video messages left on the night!